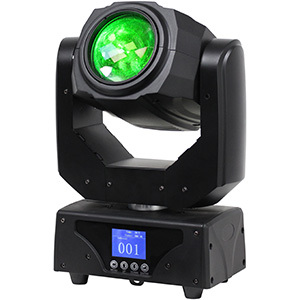 The new Inno Pocket Spot LZR is a hybrid mini moving head that utilises a bright 12W LED source as well as a powerful, rotatable green cluster laser (30mW), letting mobile DJs generate atmosphere-enhancing beam effects enhanced with eye-catching laser dots. 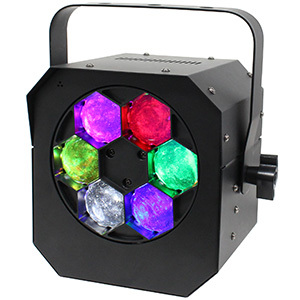 This concoction of laser dots and slicing colour beams is ideal for bringing excitement to the dance-floor at wedding receptions, birthday parties and school proms, adding movement, colour, and intense laser effects to the lighting mix. 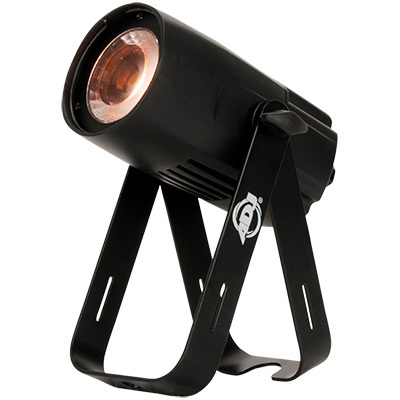 The Inno Pocket Spot LZR is as versatile as its predecessor, enabling users to create widespread lighting displays thanks to its flexible 540-degree pan and 230-degree tilt movement. 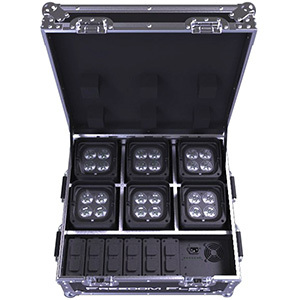 When using multiple LZR units, these displays can also be inverted using the Pan/Tilt Inversion mode, which allows DJs to easily generate a symmetrical lightshow, working especially well when the fixtures are mounted to truss totems on either side of a booth or stage. Combined with a tight 13-degree beam angle, the Inno Pocket Spot LZR’s movement ensures that cutting beams of light can be sent hurtling through the air for a mesmeric, high-energy display that can be complemented with fog and haze. 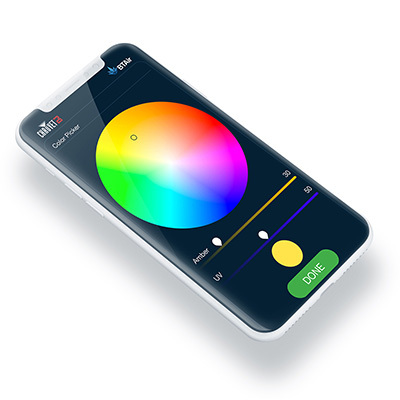 The colour wheel lets users choose from seven options – red, orange, yellow, green, UV purple, blue and pink – plus white, as well as giving them the ability to create split-colour beam effects. The separate GOBO wheel, meanwhile, offers seven fixed GOBO patterns, plus spot, as well as GOBO Shake and Scroll features for further enhancing the patterns. 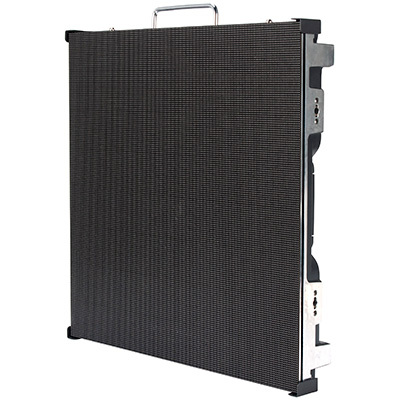 So, whether DJs want to fill the dance-floor with distinctive patterns or use the open GOBO to spot tables, wedding cakes and other event features, they can keep things diverse. 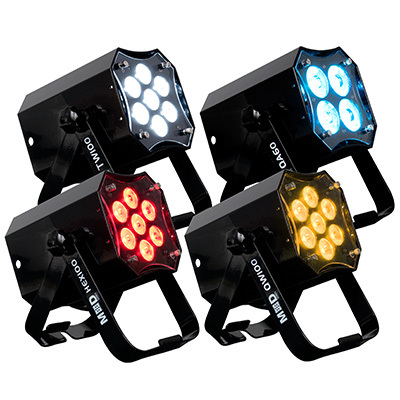 In terms of control, ADJ has designed the new Inno Pocket Spot LZR with three operational modes: DMX-Controlled, Sound Active and Internal Show. 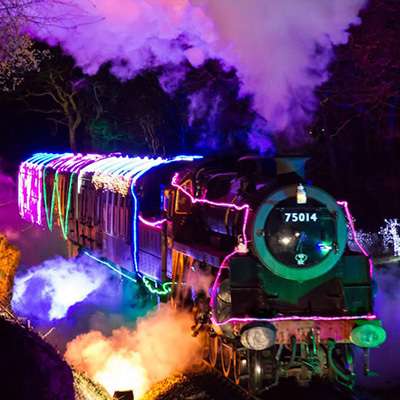 Using the Sound Active and Internal Show settings, DJs can generate a series of simple but effective displays, selecting from four varied built-in shows and using the sound-to-light feature to ensure that they match the music they’re playing. The Inno Pocket Spot LZR is also compatible with ADJ’s separately sold UC IR remote and Airstream IR app, the latter of which enables dynamic control directly from the user’s iOS device! 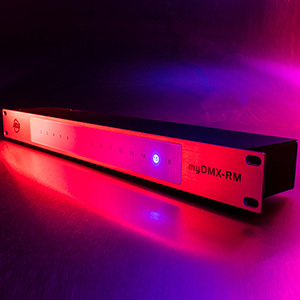 On the other hand, for those wanting to produce something truly special, customised to the tastes or requirements of their clients and audiences, the DMX-Controlled mode offers 13-, 14- and 16-channel settings. This grants users control over everything from fine pan/tilt movement to laser rotation to GOBO/colour selection, for in-depth programming. No matter how or where users decide to put the Inno Pocket Spot LZR in use, its low weight (3.4kg) and compact measurements (159 x 147 x 265mm) make it a portable, easily manageable addition to any lightshow. 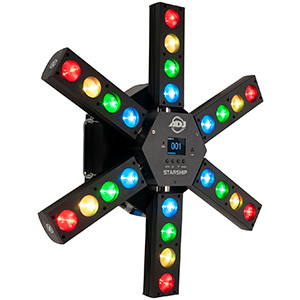 With an Omega bracket also included, it’s easy to hang the moving head from trussing, allowing mid-air beams, laser clusters and colourful GOBO patterns to be created down on the dance-floor. The Inno Pocket Spot LZR is available now from ADJ dealers with an SSP of £255.00.